Many runners end up running races and not getting their basic right. Their race results. In this multipart post, we seek to answer how errors get injected into different parts of the process. The first step is where the data gets captured. The registration platform. It has often been seen that many event organisers go to multiple platforms and list their events for registration across several of them. One race organiser in Chennai took in about twelve platforms and should definitely get the record for that.Runners often take part in such events and this leads to a less-than-optimum experience for them. We feel that runners must get the best service they can when they use our registration platform. To this end, we thus seek exclusivity. Here are TEN strong reasons runners ( and race organisers ) must know how this matters to them. 1. Event features sell, not distribution channel: Runners register for the event, not the distribution channel on which the event is listed. It is the event as a package that sells. The registration partner is an enabler. Think of this as a runner. If you want to register for a particular run, you should have heard about it and must have a favourable opinion about it, for you to go and register. Once you have made up your mind, then you will go and register in whatever platform it is. So it is the event that sells and not the distribution channel for the event. 2. Not Commoditized products: If it is a book, a CD, a movie ticket, a flight, a hotel room or similar then a ticketing partner or a platform can suffice. But if it is something like an event that has so many distinguishing attributes, the distribution channel does not make any difference. 3. Overused Database and Breach of Data Privacy: Event organisers often fall prey for the pitch made by the multiple registration partners that they will market to their own databases. Event organizers who are struggling to register runners then take on multiple partners in the hope that they will be able to cast a “wider net”. Nothing can be more fallacious than this. This is because their databases are being continuously spammed either by emails or smses for multiple events that runners soon develop apathy to further communications. Also, the runners who register now are lawful preys for their future campaigns. So in effect, the runners that you add by your own organic efforts are being handed over to them. At YouTooCanRun we consider the data of each organiser as belonging to them. 4. No Backend Support: Most registration platforms are only a piece of technology. A form linked to a payment gateway. After that, the event organizer is pretty much left to handle the data on his own. He gets a dump of data and money. YouTooCanRun believes that the process does not end there. The forms and the payment gateway are the simplest things any kid in a garage can do. But what is required after that is a whole host of processes ( we call it data curation ) after the data has been captured? This results in a clean quality data going out to the event organisers, wherein we are assured that there are no errors. Errors injected in the registration process travel down the process line and become errors all along the subsequent processes resulting in not getting smses, timing certificates, wrong results, wrong gender prize winners coming on the podium etc. 5. Lack of Domain Expertise: Behind every service, there needs to be a depth of domain expertise to be able to render that service. YouTooCanRun is founded by a runner and we are lucky that most of our team members have taken a passion to running either before or after they joined us. This ensures that our members who serve our clients know what they are doing and what the sport is all about. We are not a generic registration platform that caters to all sorts of events and that makes a big difference. 6. Data Validations. Our forms have extensive data validation built in, which means that we try to capture as much of the data correctly at the first point in time. We have about Three Lakhs Fifty Thousand runners in our database; probably one of India’s largest. Most of the time if you enter your email id and date of birth, your data from an earlier registration gets picked up. This ensures that the data is as error-free as possible and the runner can proceed to re-verify the same, choose the race category and other options and go to the payment gateway. Giving event organisers and runners the best quality of data output is something we take pride in ourselves. 7. Tracking Marketing Campaigns: Probably the most significant is that, if you have multiple platforms, there is often no way to test the effectiveness of your marketing campaign as an event organiser. You will never know which is the campaign that worked and led to that registration. In effect, you will have no control over what campaigns of yours and what marketing initiatives of yours lead to better registrations. Such Marketing campaigns lead to waste of resources besides being counterproductive in some cases. 8. Lack of ownership: When there are multiple registrations platforms no one feels responsible for the success of your event. In our case even though we do not spam, we do a lot of relationship building marketing that builds value to the event. We continuously monitor the numbers, see how it is performing over last year and work with event organisers to give us creatives etc. so that can promote the event in a clean and ethical manner. Best practises are shared and event organisers grow their event without irritating the runners with too many multiple messages. 9. Refer a Friend feature: There is a difference between technology-driven registration and relationship driven registration. Most registrations come because somebody or the other is going to run the event. Our “Refer a Friend” scheme capitalises on this and recognises the social nature of participation in running events. We continuously add features such as this to see that the registrations grow in a nonintrusive manner. 10. Virtual Goody Bag – Sponsor servicing: We have several alliance partnerships such as Jet Airways, Ginger Hotels which are exclusive. Runners who register on our platform are offered a bunch of sponsor offerings in our “Virtual Goody Bag” where he can pick up offerings from sponsors of the event organiser as well as our value-add partners. Having exclusive registration partner ensures in uniformity of experience for the runners and full range of activation for the sponsors. 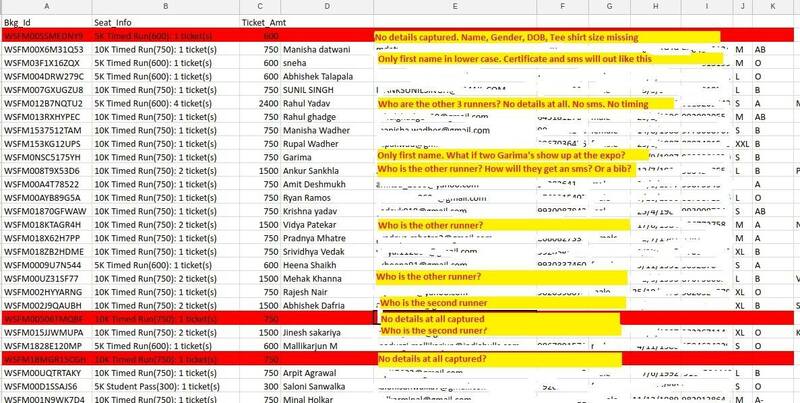 PS: The attached screenshot is the data received from a generic registration platform that was used by a race recently. We filled up the dataset by calling the registrants. This, of course, takes time and effort which many organisers cannot afford in the last few days leading to the race.